Enhanced recently announced the return of the Enhanced Sessions series. 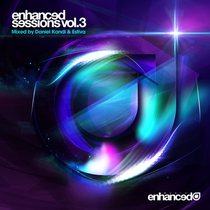 Continuing with the tradition of showcasing the leading talent from the Enhanced family, Volume Three is compiled and mixed by Daniel Kandi & Estiva, not only stars of Enhanced but firmly established as leading lights of the trance genre, hitting charts with their productions and touring the globe at some of the world's finest events. A long time favourite artist for the likes of Armin van Buuren and Above & Beyond, Daniel Kandi has been responsible for some of the biggest releases on the label in recent years, and his own Enhanced imprint 'Always Alive' has quickly earned a good reputation. Mixing his first compilation for Enhanced, Daniel's mix builds from sparkling progressive through to peak time euphoria. Packed full of exclusively unreleased tracks and remixes, as well as two brand new Daniel Kandi productions including his first ever vocal original, he drops current and future anthems from the likes of Tritonal, Exostate, jjoo, Mike Danis & Johnny Yono, Willem de Roo, Braiman & Falcon to name a few. Having mixed the first Enhanced Sessions compilation Estiva has enjoyed a fantastic rise ever since, successfully making the transition from the future talent bracket into possibly a genuine star of the scene. Responsible for modern day vocal tracks such as 'Better Days' and 'Death Of Me', the mix is full of unreleased tracks - 12 in total from the likes of Temple One, Ost & Meyer, 7 Skies, Juventa, LTN, Speed Limits and many more. It’s released Monday November 26.